In the spring of 2016 ARECA and Alberta Agriculture and Forestry approached GWFA, with a high legume pasture project. 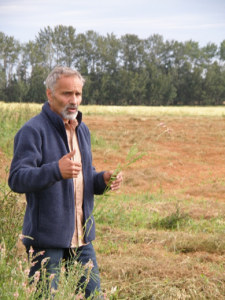 The idea behind the project is to plant a pasture stand containing a high percentage of alfalfa mixed with sainfoin. The sainfoin contains beneficial tannins that help to offset the effects of bloat in cattle. Recently Mountain View Sainfoin had been released to the industry. 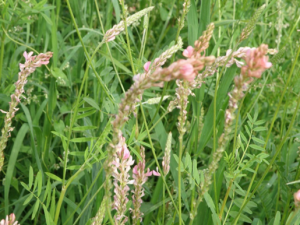 It is a more competitive sainfoin variety than its predecessors and has good establishment potential. In order to help increase the awareness of this sainfoin blend and its potential beneficial effects, ARECA and Alberta Agriculture put together this project. Currently Mountain View sainfoin is only available in a blend with alfalfa. So, the blended alfalfa/sainfoin was provided to each cooperator in this project to plant on their pasture. GWFA partnered with Murray Abel for this project. Murray had a 10-acre field he had previously used for grazing corn and decided to convert those acres back to permanent forage. He seeded the trial in May. Unfortunately, last spring was very dry, so the seed had delayed germination. There was considerable weed pressure initially. Weed pressure is not uncommon in the first year after seeding a forage stand without a cover crop. It is a good reminder to look at the juvenile plants coming below the weed canopy and remember that they will out-compete the weeds in year two and beyond. After the summer rains the stand did established well and is competing with the other weed species. During the fall, a final walk and plant stand count was done to determine if there were any areas that my need touch-up seeding. A few spots that needed some touch-up seeding we identified and the seeding will occur next spring. There was no grazing during the summer, as it was important to give the sainfoin and alfalfa a chance to get established. We held a high legume pasture field day at this site last year in August. This helped bring awareness of this project, but also to the importance of grazing high legume pastures. The project is designed to run for a number of years. Year one was the establishment year, in year two the plot will be fenced into small paddocks and grazed. Grazing cages will be placed at random throughout the 10ac parcel. Once the cows are released into the pasture clippings in the grazing cages will be done. The clippings will then be sorted by species and then dried down to determine the percent composition of the stand. Also, the weight of the clippings will be taken and a yield on a per acre basis will be calculated. This will be done each year going forward for the duration of the trial. This will tell us how much available yield there was, grazing days, pounds of gain per head, regrowth potential, economic impact, longevity, etc. this stand has. These are very important numbers to calculate as there is an industry push to graze high legume percentage pastures in order to improve the rates of gain on cattle, increase carrying capacity or grazing days, and improve overall pasture health. This is a very exciting project. Stay tuned, as we will be collecting data through the summer of 2017 and will be able to begin seeing how well this pasture and the cattle perform. We are hosting a high legume field tour on Aug. 22, 2017 in conjunction with the Gentec Field Day at the Lacombe Research Centre.